A plan pushed by the Democratic National Committee has triggered a fierce backlash within the party, which is already lagging behind Donald Trump. SAN JUAN, Puerto Rico — Democrats are at war over the party’s most precious commodity — voter data — and it’s threatening their chances of beating President Donald Trump in 2020. The fight involves a trove of Democratic voter information splintered among state parties, outside groups and the Democratic National Committee. The DNC wants to pool all of it into one massive database that could be leveraged to the benefit of the party’s eventual presidential nominee. But state parties are accusing the national party of mounting a power grab that could enrich a handful of elite party figures. But the DNC’s answer has provoked a fierce backlash among state parties, who have most of the ownership rights to the party’s voter file. Tensions flared at a meeting of state-based party officials here last week. The DNC is advocating a proposal modeled on the Republican Party’s data operation. It would amass all the voter data from Democratic groups into a single, for-profit entity. The structure has two advantages. Because the voter data firm would be set up as a private organization, it would allow Democrats to raise money for it free from campaign finance limits. The setup would also enable liberal groups to integrate the data as they gather it, instead of continuing with the balkanized system currently in place. In theory, the progressive ecosystem could then work in concert to collect more data points on each voter. But in interviews with more than two dozen state party chairs, vice chairs and executive directors, the response to the proposal being pushed by DNC Chairman Tom Perez and his leadership team ranged from skeptical to outright hostile. Both sides agree that being able to swap data seamlessly with outside groups is necessary, but they’re at loggerheads over the best way to make it happen. “I’m not willing to give up one of our most important tools to a group of people who have never even worked on a campaign before,” Trav Robertson, chairman of the South Carolina Democratic Party, said of Perez’s team. If not resolved soon, the fight between the states and the national party could hobble the eventual Democratic nominee as he or she emerges from a bruising 2020 primary election. President Donald Trump has been preparing for reelection since the day he was sworn into office, and his Democratic challenger will need a robust data infrastructure to effectively take him on. 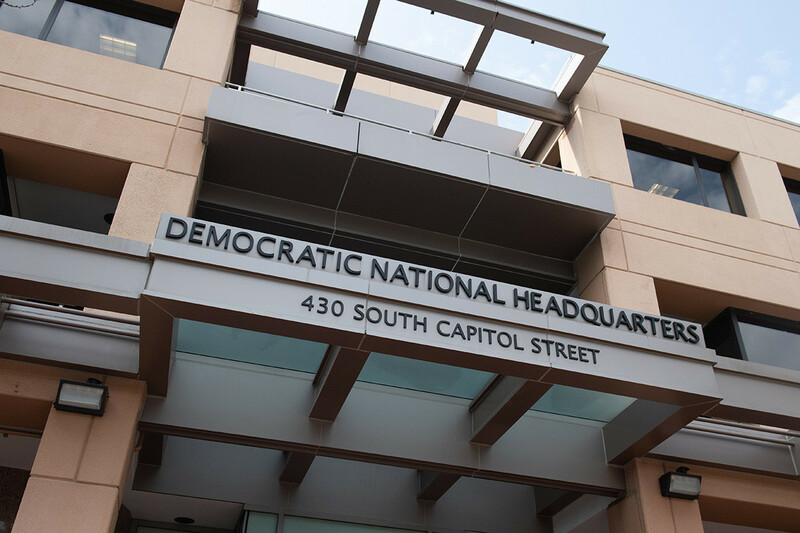 Frustrations among several state party officials focused on the DNC’s chief technology officer, Raffi Krikorian, who came to the party from Silicon Valley, and on its recently named chief executive, Seema Nanda, who worked for Perez in his previous job at the Labor Department. Neither official has significant campaign experience. The DNC exacerbated tensions by telling state parties before last weekend’s meeting that the national committee was considering cutting a $10 million grant program to state parties that it launched during the 2018 election cycle. Committee officials also suggested they might eliminate Association of State Democratic Committees employees based in D.C., according to several people familiar with the discussions. “There are times when this fight seems very lonely, when we have to continue to fight the DNC on things we shouldn’t have to,” Ken Martin, the head of the ASDC, said during a session on Friday as heads in the audience nodded. Under the proposal pushed by DNC leaders and other Democratic operatives, including Priorities USA’s Guy Cecil, state parties would license out their voter data to a separate trust. A voter data firm currently headed by Jen O’Malley Dillon, the co-founder of Precision Strategies, and Lindsey Reynolds, a former DNC chief operating officer, is expected to be the launching pad for the project. A source familiar with the proposal said funders would be prohibited from sitting on the board of trustees to avoid conflicts of interest. Former Vermont Gov. Howard Dean has been floated as a potential adviser because of his good relationships with state parties, according to officials at last week’s gathering. But other than those names, few of the people behind the proposal are known, fueling suspicions. Unlike the Republican National Committee, which had control over its voter file when it created its streamlined data operation, the DNC needs buy-in from state parties in order to create such a structure. Ray Buckley, who as chairman of the New Hampshire Democratic Party and the former head of the ASDC is one of the most prominent state party leaders, said he hadn’t formed an opinion on the proposal. But “I don’t think we’re anywhere near any sort of decision,” he added. Several state party officials said they were aggravated that they could not get definitive answers about who stands to benefit financially from the project. Asked whether some of the people pushing for the new database already or might eventually have a monetary stake in its success, the DNC acknowledged that was possible. A DNC official said several Silicon Valley figures are interested in investing in the proposed overhaul. That could yield a potentially large infusion of cash and speed the project along, its proponents said. O’Malley Dillon has had conversations with people associated with LinkedIn co-founder Reid Hoffman, who has poured millions of dollars into progressive causes since the 2016 election, according to a person familiar with their talks. The collaboration could allow the plan to proceed without the complications of complying with campaign finance restrictions. But state parties expressed bewilderment that the national party is expecting them to cede some control of one of their key assets — for what they consider to be nothing in return. National Democratic officials, in turn, said the state parties were being selfish and not thinking about the broader cause. “There’s definitely, ‘what’s in it for us?’ questions still there,” said Valdez Bravo, a vice chairman of the Oregon Democratic Party. Other Democrats were exasperated by the impasse itself — and the collateral damage it could do heading into the 2020 campaign — as opposed to the details of the plan. “The logjam has to be broken on this because we need this in order to win,” said Jim Roosevelt, co-chair of the DNC’s rules and bylaws committee and a longtime party official, who declined to take sides. The DNC expressed confidence that many states would embrace their proposal early next year. But several state party chairs whom the DNC referred Politico to as supportive of its plan were noncommittal in interviews. “I think there are some concerns that are still out there and those concerns have to be addressed or those who are skeptical have to come up with an alternative,” said Brandon Dillon, chairman of the Michigan Democratic Party. Inaction, he added, is not an option. Several state party officials said they’re working on a counterproposal to present in early 2019. They said it would still allow data swapping among the party and outside groups while keeping the voter file under their control. The gridlock reminds veterans of Mitt Romney’s presidential campaign of their experience in 2012, when the RNC was preparing to take on an incumbent president, Barack Obama. After the 2012 Republican primary, Romney tried to ramp up quickly with a disorganized RNC. But it was soon bombarded by $100 million in attack ads from Obama’s campaign painting Romney as a callous corporate raider. The Democratic nominee could face a similar broadside in 2020 from the Trump campaign. How can Gaza’s contaminated water catastrophe be solved?